The Webinars provide information on the GI Bill, related legislation, and processes. These presentations are provided to a closed audience that includes School Certifying Officials, Education Liaison Representatives, State Approving Agency employees, VetSuccess on Campus Counselors. Veterans and dependents. Please note: the online PowerPoint presentations are only viewable in Internet Explorer; you will need the free Adobe viewer to view the Adobe PDF presentations. Webinar FAQs by topic on the School Certifying Official FAQs page. Disclaimer: The information in these presentations should be considered talking points for discussion and information sharing only. This information is not comprehensive and should not be used as a definitive source of information. Information on these presentations was current and correct on the date given. 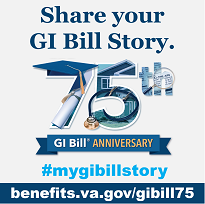 Colmery Act, also known as "Forever GI Bill"
Keep receiving education and training benefits from VA by verifying your attendance.